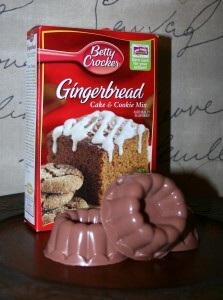 My gingerbread bundt cake sold for eleven dollars at the craft bazaar auction. Hard to believe but that’s the God’s honest truth. I’ve been making that cake for thirty odd years and my family just scarfs it down. But no one gets worked up about it. It is just one of those things we eat at Christmas. Well, except for this year. This week’s giveaway is a trio of handmade gingerbread scented soaps in the shape of a bundt cake, gingerbead cake mix, and a signed copy of Moving Violations. I adore the scent of gingerbread, even beyond Christmas time. I especially love a slice of warm gingerbread served with cool lemon pudding. This story is a revised excerpt from one of my “drawer novels,” books we writers keep in a bottom drawer, knowing they are not fit for publication. But I hold the experience near to my heart. I loved Bernice’s voice and her determination to keep her family together, even as they tore themselves apart. In order to win, I’m asking you to share this contest on Facebook. Or as always, you may complete any of the previous week tasks (Tweeting, becoming a fan on Facebook, liking my author page on Amazon, etc.) to enter. You must leave a comment on my blog or Like this Facebook post to be entered. The winner will be announced at 9 am on August 2, 2013. Thanks for playing!